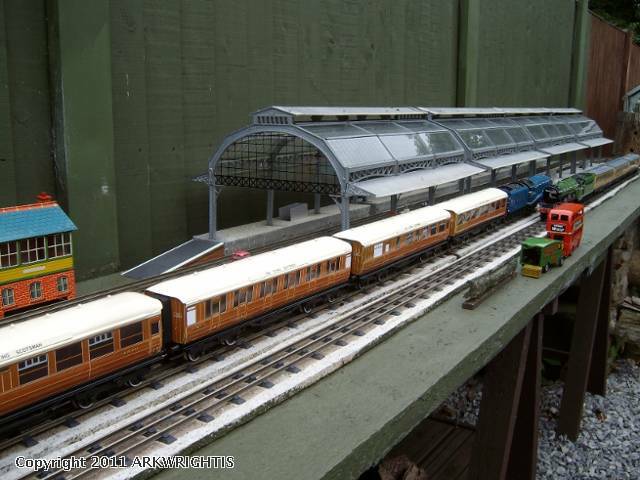 (Guest) J&C Studios O Gauge Archive Outdoor Layouts Outdoor Layouts Are Possible Anywhere? Topic: Outdoor Layouts Are Possible Anywhere? Kicking off this new category, here's a view looking down on my modest situation in the UK. The available garden space is roughly 25' square, and yet as you can see I've managed to first of all obtain permission from my good lady, and then construct this right angled pair of continuous loops. 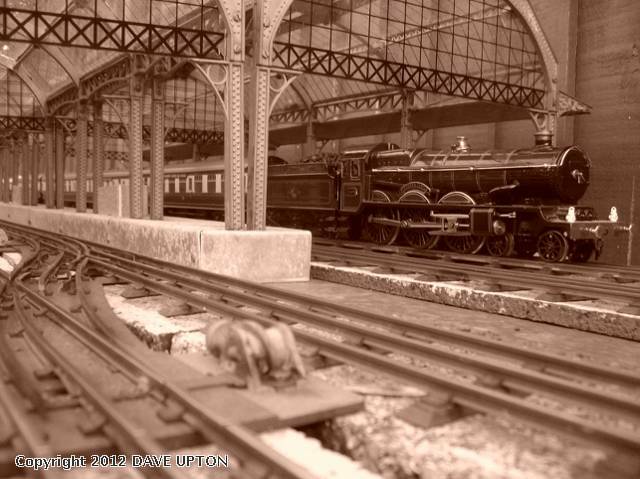 In fact when the photo was taken the layout was still under construction. The rough ground beyond the garden fence is in fact a railway embankment, that stands roughly as high as the house. 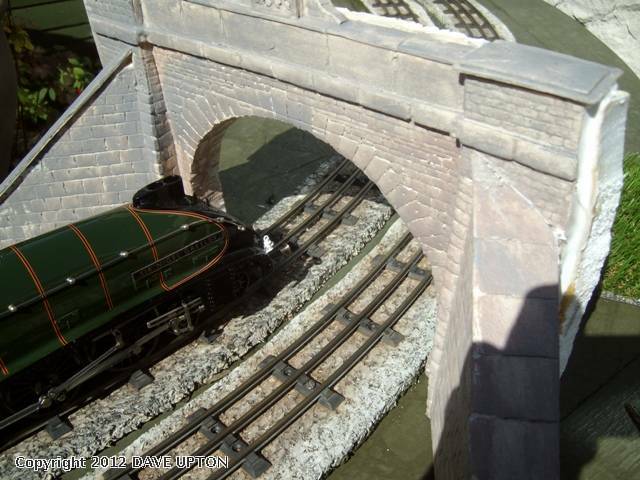 We get some very realistic sound effects on the layout at times, especially when we get one of the steam specials coming by! 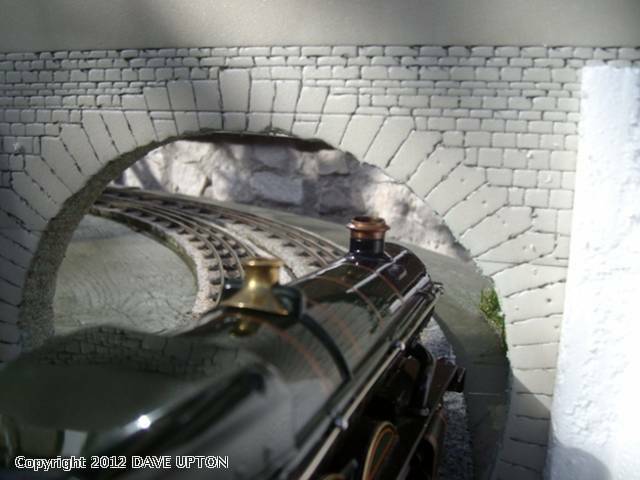 Here's a close-up picture taken of the layout about 12mths after it was first constructed. 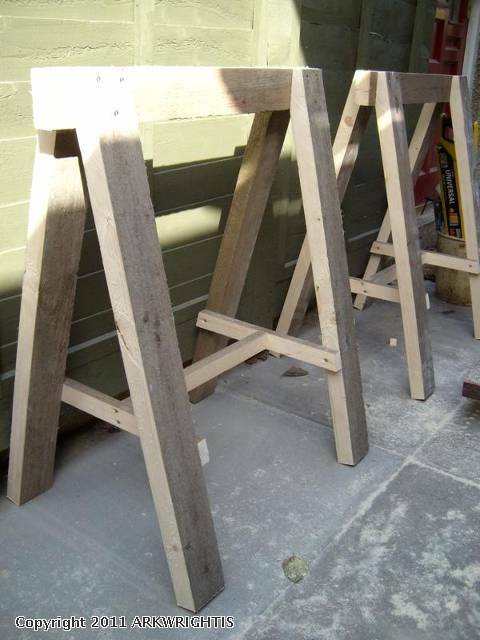 From this picture you'll get a better idea of how it was made using what we in the UK call scaffold boards. 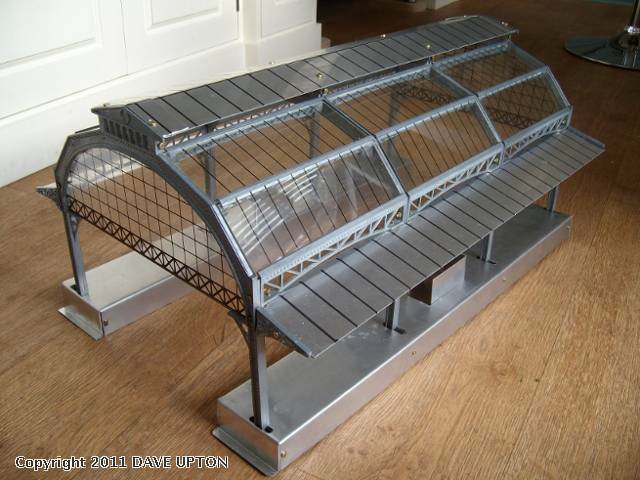 These are used for walkways in conjunction with scaffolding in the building trade. 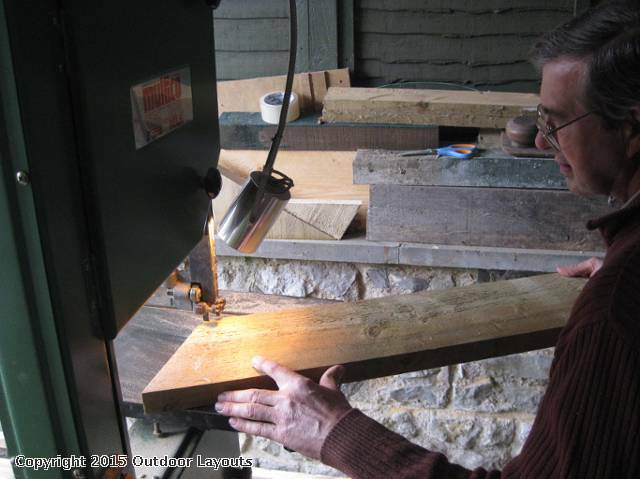 Used one's at the time were costing me about 5-6 UK pounds, which equates to an awful lot of timber for your money, and out of about 25 boards in total, the entire running surface and the 18 or so trestles were all made up. I had it constructed so that it would be easy to break down and move should we ever decide to move to a house with more land. Waiting to go for a run are a rake of Darstaed Pullman coaches. The real things were the last word in luxury railway travel and the models are a real credit to them. The canopy stations you see have a mottled look about them. 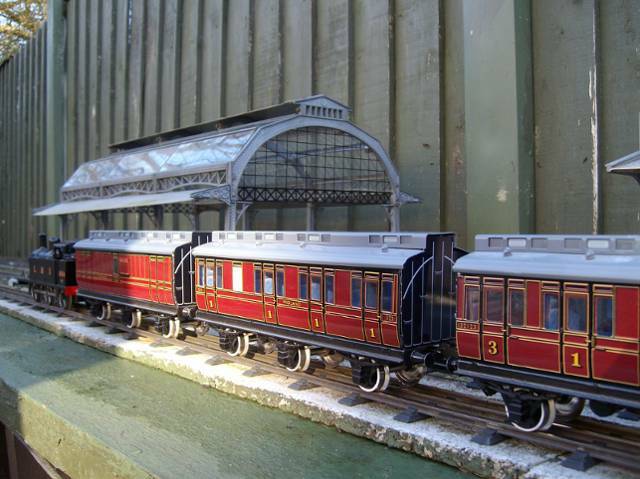 This is because all the tin printed components of the station have been replaced by formed aluminium so that four of these wonderful structures can live out of doors on the layout all year round. This is how the station looked after my conversion work for outdoor living. 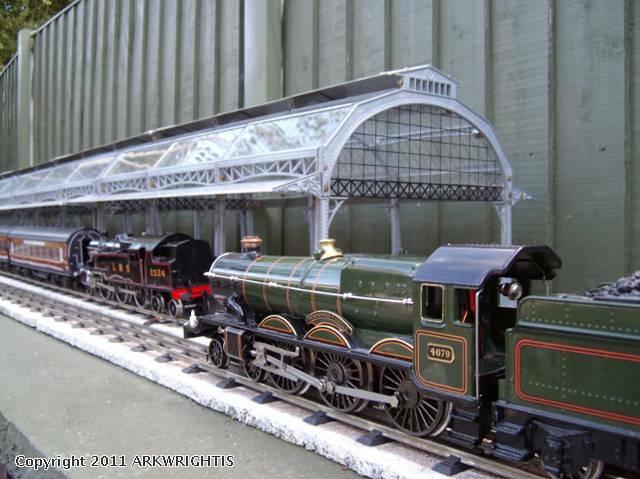 Very nice, I really like this outdoor layout. Thank you John, this site is pretty good too! 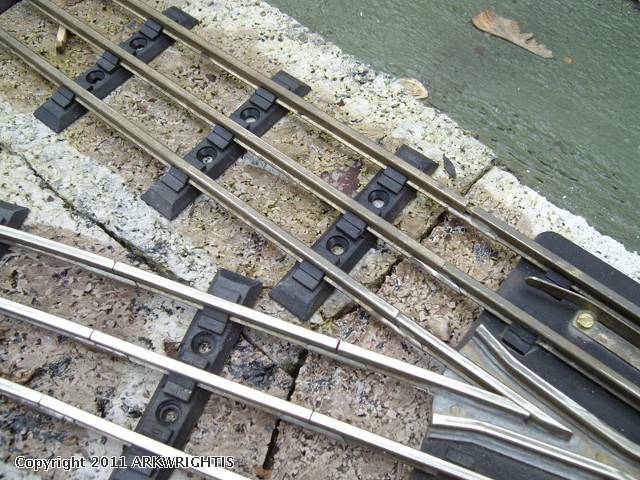 The biggest challenge to anyone wanting to have a layout out of doors is the way the track will tarnish very quickly and the worse it gets the poorer the electrical contact between drive wheels and track running surface. I find the only really effective solution is a track rubber, but this does involve a good degree of elbow grease. 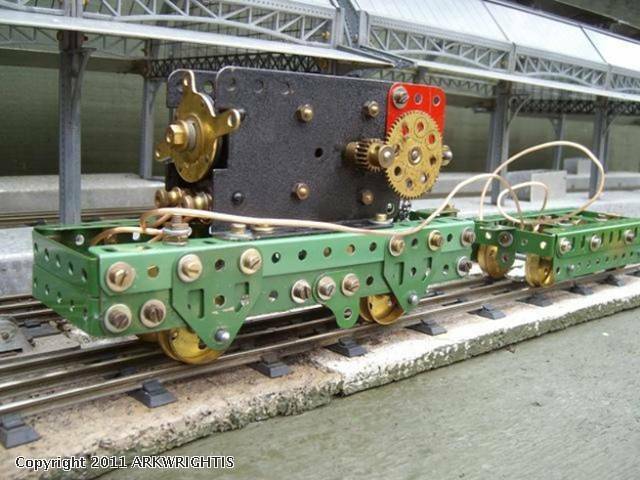 This is a bit 'tongue in cheek' but here's my experimental Mk 1 track cleaning device made around a 1920's Meccano model. Because the track cleaners are situated directly under the device, its centre rail pick-up is carried in the rear 'wagon'. The device only works in theory and so I'm working on a MK 2! If anyone has a totally effective system to suit the outdoors I'd love to hear about it. 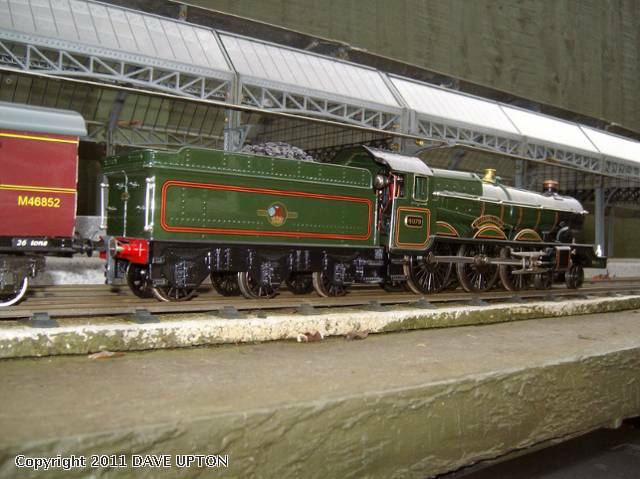 This is a Castle Class locomotive in British Rail gloss green as produced under the ACE Trains label. It was originally produced for ACE by Andries Grabowski of Darstaed, who in turn has recently produced his own Castle Class loco, which I hope to be able to feature in due course. The model pictured has remarkable capabilities, performing very well against the likes of the heavier A3 and A4 class locomotives. 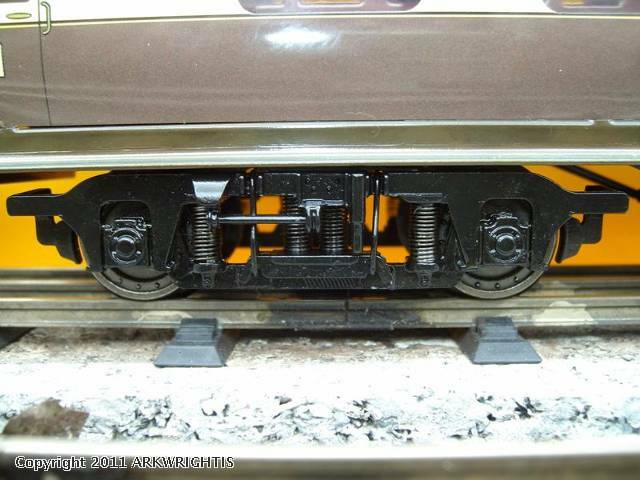 The model is shown at the head of a rake of British Rail non-corridor coaches which are also produced by Darstaed. These are very substantial with detailed interiors, full internal illumination and virtually friction-less axles for easy running. To bring the thread back to the subject in hand - outdoor layouts, here's a picture I've recently turned up of my simple set-up. 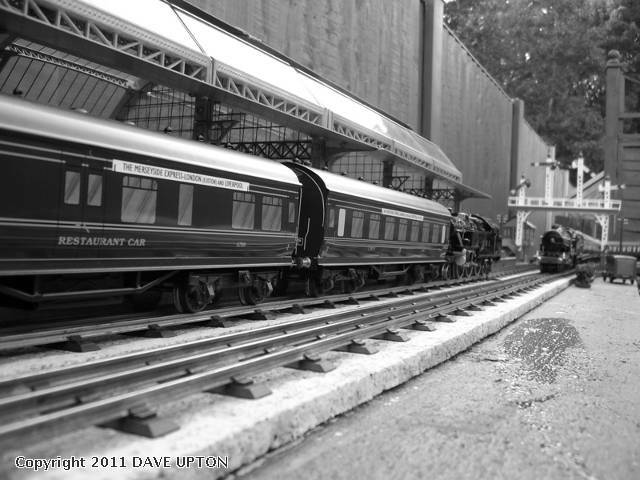 An A3 & A4 are about to pass each other, whilst a couple of tin MINIC brand clockwork vehicles go about their business. 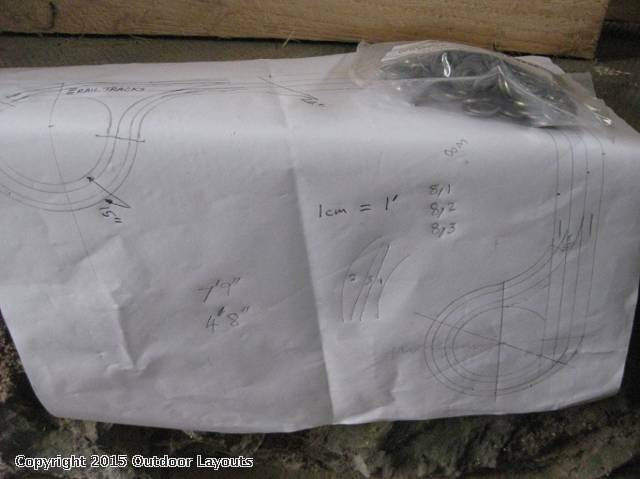 Here are some images showing the layout structure being made up. 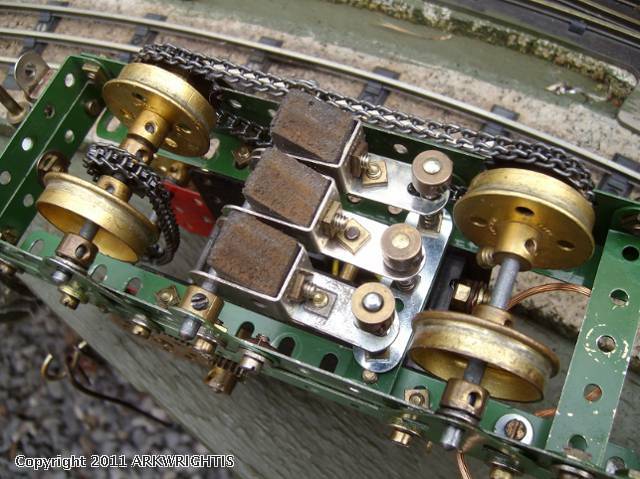 The biggest challange with an outdoor railway is keeping good electrical contact around the track as without it, the trains are going nowhere. 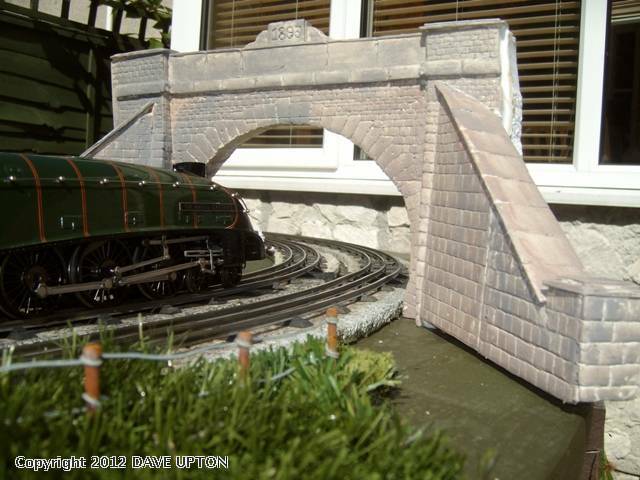 My own track is made up by Maldon Rail here in the UK. 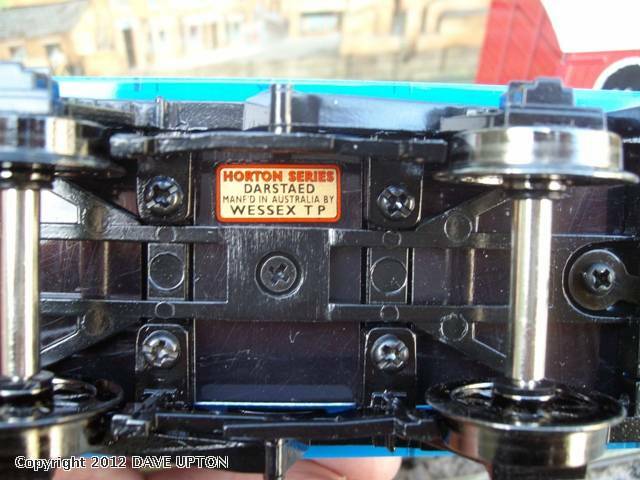 Originally conceived by Michael Foster, this track authentically replicates pre war Hornby Solid Steel track. 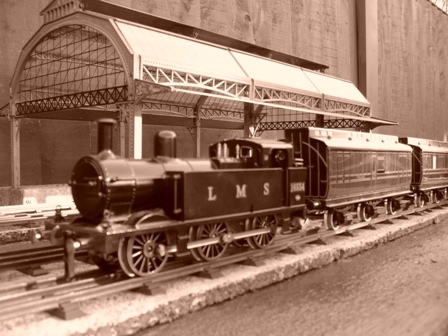 As the name suggests the Hornby originals were made out of solid steel rails on pressed tin sleepers. These were fine for indoors, but of no use out, so Michael Foster put together a product that not only replicated the original track, but could work outdoors as well. 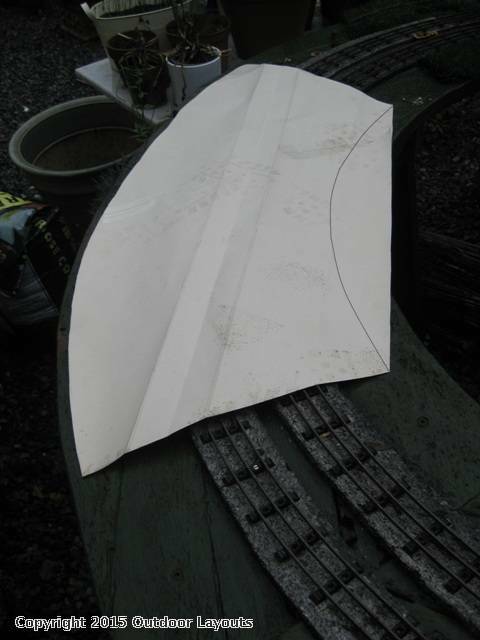 Today the track is made of Code 200 Nichol Silver steel on ABS (plastic) sleepers. Not sure what the points bases are made of, but it looks totally authentic and is unaffected by extremes in weather. 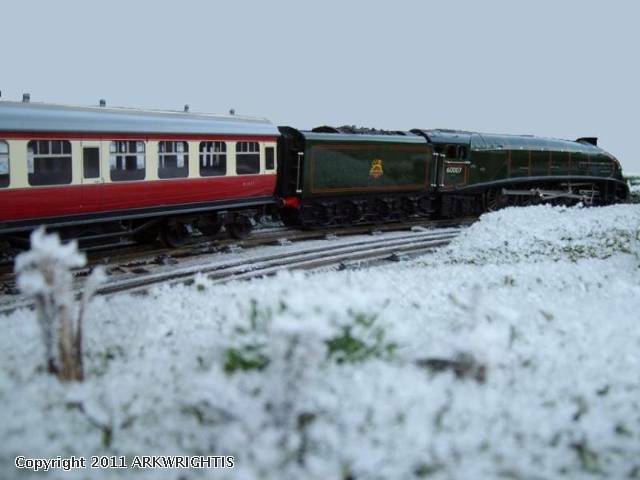 Despite this combination, the weather can still disrupt service as it can on the real railways. 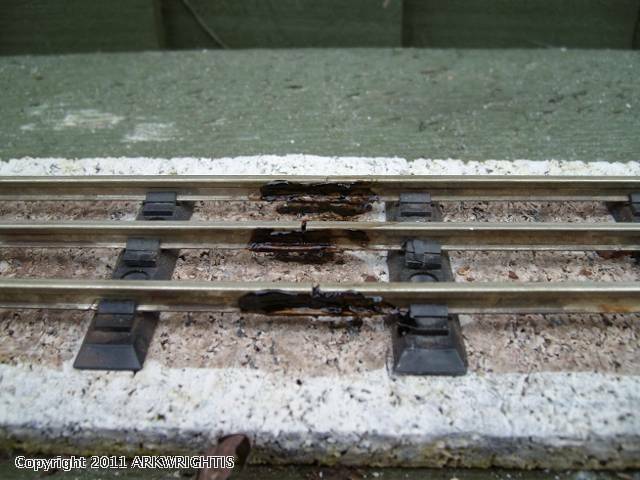 In this picture looking down on one of the points, you can clearly see how the main line has been brightened up with a track rubber, and runs fine, but the unattended to siding is brown with tarnish and would not run anything very well. The tarnish will quite swiftly return meaning that any running session is going to call for the track to be attended to beforehand. The next challenge is ensuring you have good electrical conductivity along the whole track system. The ultimate solution is to solder wires across each and every joint but for me this was a fiddly job too far and so I've adopted a different approach, which as you can see in any of my YouTube clips works well. I have first of all ensured that the ends of each section of track to be joined are brightened up. I have then liberally coated the ends with a combination of grease and a protective product known in the UK as Waxoyl (black). Both sections of track are then brought together. The process looks quite messy in this picture, but the application soon 'settles' and before long not only works very well, but looks very authentic too. 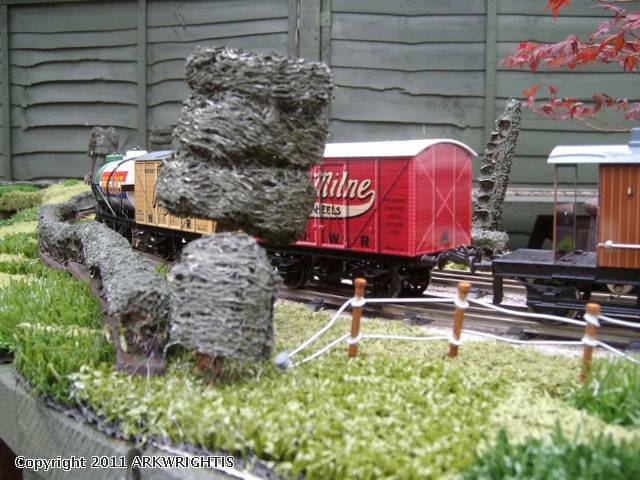 Excellent outdoor Tinplate Layout! I really like the re-done station and track cleaning car. I'm always amazed at how innovative we 3-Railers are in getting our trains to run in the most interesting space. Not sure if you have seen the OGR Magazine issue of attic layouts. It's worth archiving to see what folks do in the smalles spaces. Glad the lady of the house okayed this layout. I'm working on getting something going in my yard for fun and need the wife's approval! Mark B. Mark, based on practical experience you have a number of approaches you can take with your good lady wife, ranging from the chocs & flowers approach - a bit passe, through to 'letting me have it will keep me quiet' approach, to the ultimate - 'we each own half of everything, so that's your half of the (yard), this is mine'! Sure to work. Dave, I LOL on that one. Our kitchen is due for a remodel so I suspect my eager excitement of getting it done will supplement the flowers & chocolates. That said, I do have a 'Green Light' if we move to the country....but that is 5 to 10 years out. Back to your layout.....i saw the Waxoyl above. It dries up and looks very real. Does it just 'pull' thing togher as it dries OR does it have some electical connectivity to it? 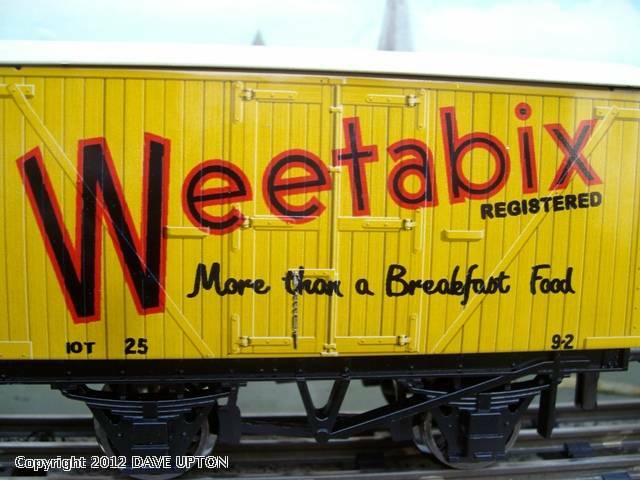 Here is a shot of my O Gauge-Lionel Fastrack(customized>>>lots of work!). 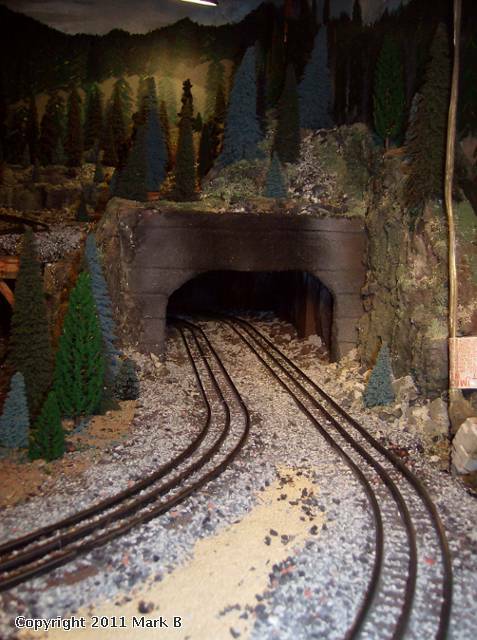 My tunnel port is carved out of 'green styrofoam for flowers and coated with wallboard plaster. 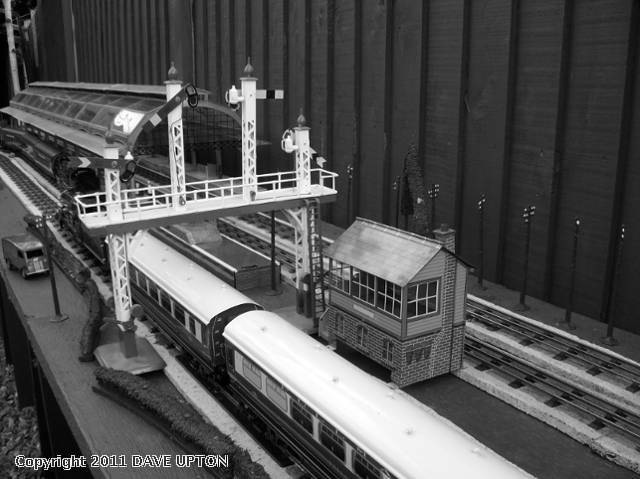 Love the moody sort of atmosphere you've managed to create on the layout. I don't know if you tried this when it comes to tunnel mouths etc, but here's a rather poor photo of a practice bash I had with sheet polystyrene. This really grabbed my attention because its perfect for the outdoors being unaffected by the weather. You get a suitable sharp pointed implement and scribe it to suit. It's looks incredibly realistic when painted etc. Concerning Waxoyle. 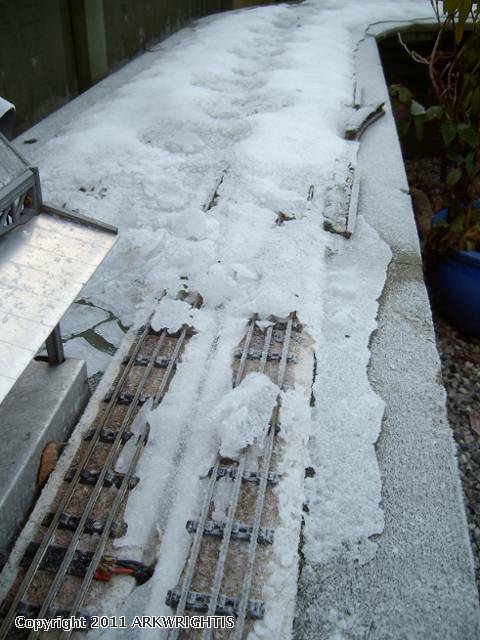 It does nothing other than protect the otherwise exposed ends of the rails & fishplates, doing a great job of keeping the weather off it. You will have something similar in The States I'm sure. Over here its most common use is on vehicle under bodies to keep rust at bay. Use it on a hot day and it becomes quite fluid. It drys to a waxy finish hence its name. 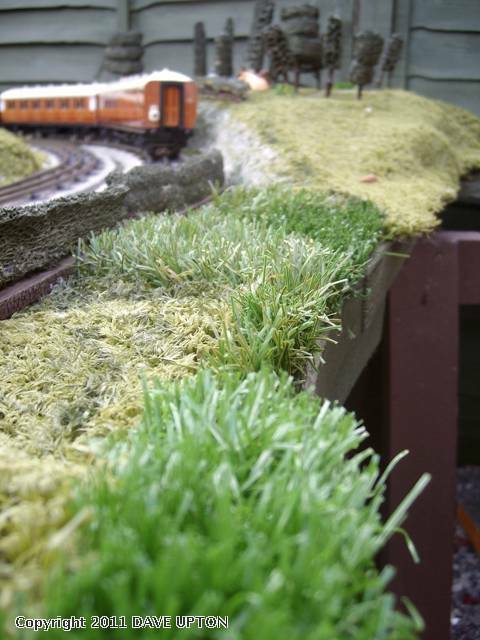 Here are a few images which show my super simplistic approach to landscaping around my garden railway layout. 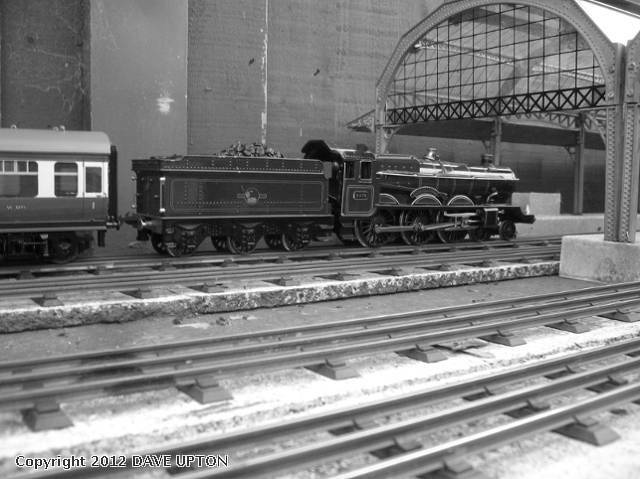 I should perhaps point out that my entire approach to the subject is driven by a longstanding attraction to the simple way in which pre war Hornby O Gauge layouts were enhanced. Hedges and trees were made of loofa, and fields were boards, painted to represent grasses with the occasional wild flowers in them. My first requirement however was: 'will the material to be used survive the elements'? 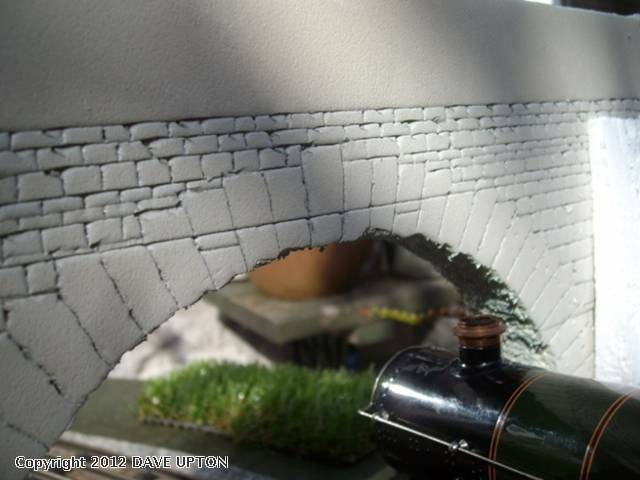 With this in mind I've used polystyrene as the basis of any line side feature such as a railway cutting pictured below. 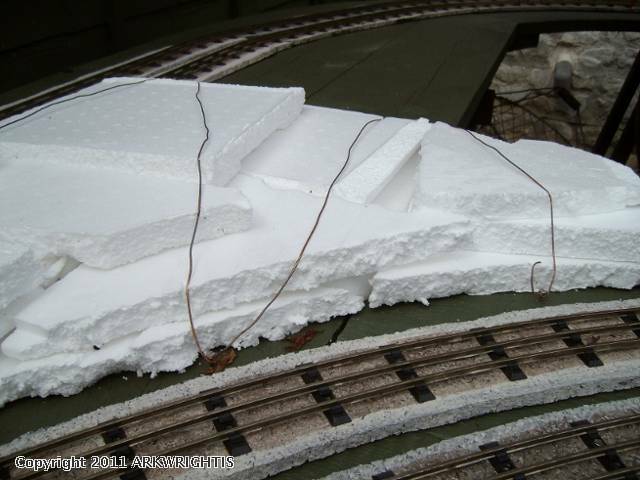 The polystyrene was suitably positioned and then held in place with copper wire, secured with stainless screws. How then to create the grasses of the fields? 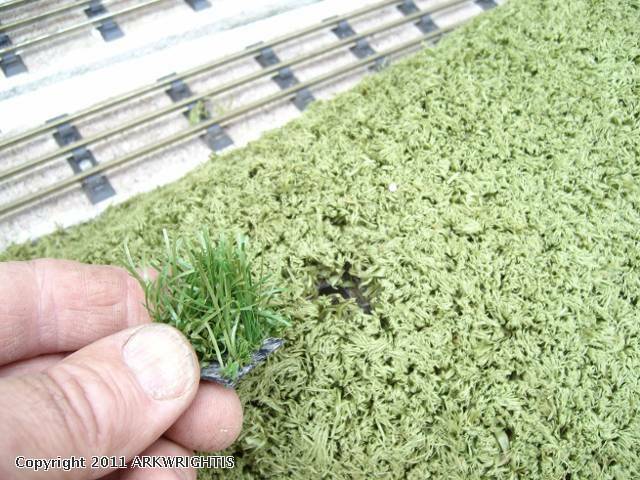 In my experience, painting would only give me so long before the weather took its toll and I'd become dissatisfied with the results, so with this in mind I turned my attention to the wonderful world of artificial grass. The range of such grass is mind boggling ranging from the market traders cheap & cheerful bright green to the artificial putting green, which is hard to tell from the real thing. I got myself a few samples and started experimenting. When I found one suitable for the larger area over the polystyrene former's I bought sufficient of this and tacked into place with small copper pins. I could see there was scope to create effects, so I cut small patches from some of the samples and 'inserted' them into the larger area. To do this you cut out a slightly smaller area from the main section and then 'insert' the smaller patch from the rear, pulling the smaller patch grass into position. Once the whole area it tacked into place, everything holds itself in place quite nicely. 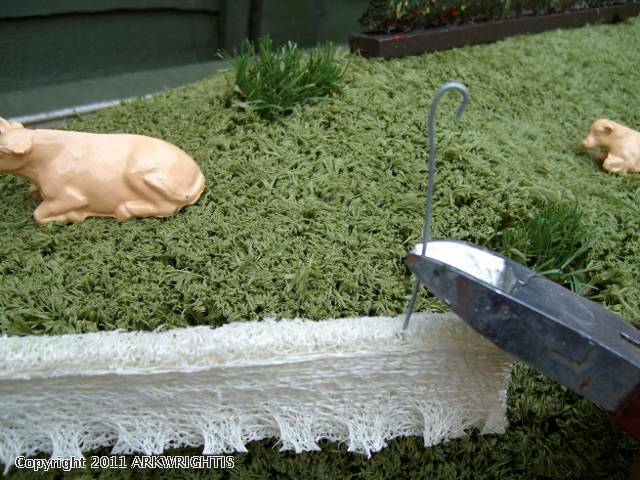 Here's the area concerned having a length of loofa hedging positioned via a length of bent wire - the wire is in the process of being pushed down into the artificial grass matting. When in place, I've found these hedges paint up very well using garden wood shade paints. You'll note the cows are perfectly content in their plastic field setting! So, here's an overview of the area concerned. It was going so very well until the cat discovered just how good this particular field was to lay down in! Fear not however, as I have another hot tip and this involves a short length of barbed wire suitably positioned. Cat soon gave up. This last image gives a general view of how my experiments have progressed. You'll note we now have a fence put up where once again making it weather proof, I have opted for nothing more elaborate than some nails and wire. This landscaping has now lived through three quite severe winters with temperatures ranging from -15 to +30 and it continues unaffected. 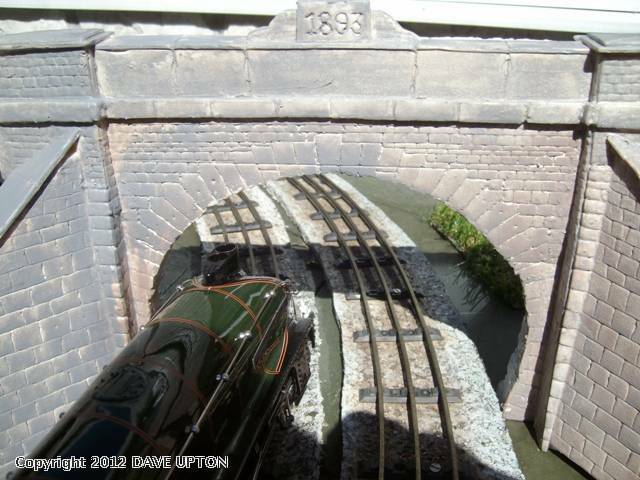 Here you have the layout coming to terms with temperatures which last winter went down to around -16 in our part of the country, but as the YouTube clips which I have taken during this Summer demonstrate, the tracks are well able to stand such weather. Somewhere under this are my much loved canopy stations. Thankfully they have been totally 'winterized'! In winter there is very little scope to run outdoors, so what do you do? In my case I play around on the computer and await the Spring. I've mentioned these above, but here are another couple of photos of the canopy stations referred to above. The pictures were taken on the day I completed the first of four which I was adapting to be able to live outdoors all year round. 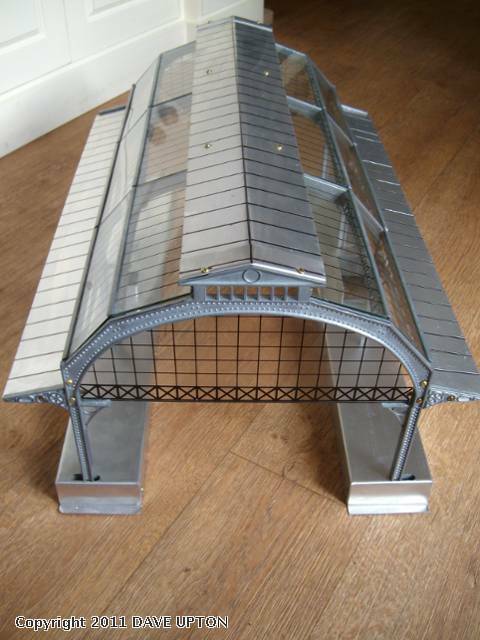 To enable this to happen all the original tin printed parts, namely the roofs and the platforms were remade in sheet aluminium and the structures were then bolted together with brass nuts & bolts. This how the stations have weathered after nearly three years of being outside. 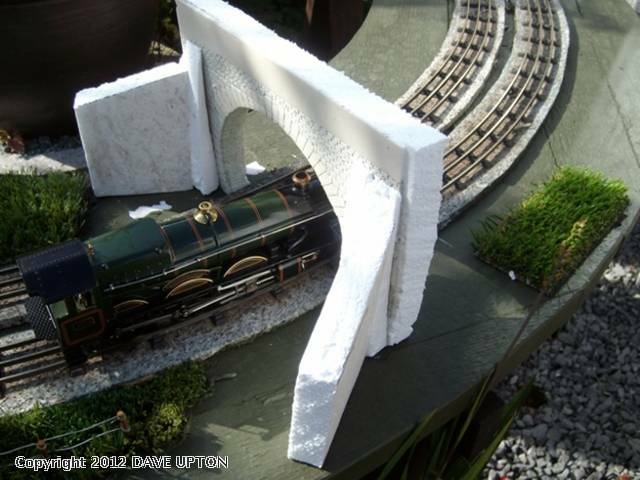 I rather think this particular blog has about run its course, so I figure I'll wrap it up with a few images of what you get with an outdoor layout such as this one. I thought there was little more I could add to this particular thread, but earlier today I realized that it was so remarkably mild there really was no reason why the layout could not be brought back to life for a while - anything up to four months sooner than I might have expected. Coincidentally, earlier today I was asked via YouTube how much looking after the track demands. To run these two trains it took me about 15 minutes to reinstate a loose wire from the track, and brighten up the track surface with a track rubber. Having done this, power was applied and away they went. 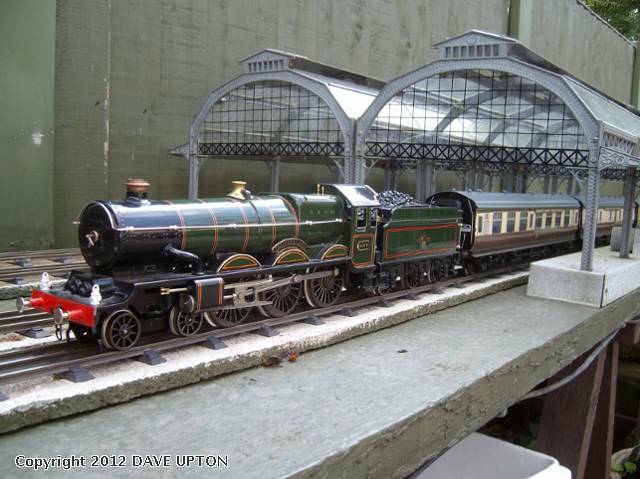 Here's a photo of the Castle Class loco taken at the time. 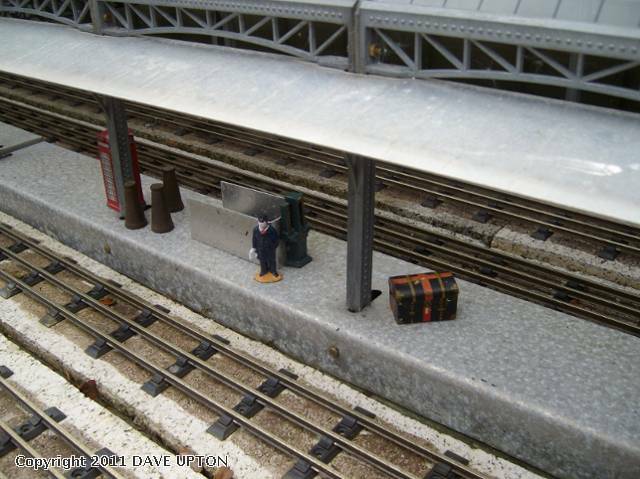 Very nice outdoor layout, Dave. You can do a lot in small space. Many thanks. We are currently experiencing temperatures down to -10/-11 but the layout experienced much worse last winter and has had no problems coping. 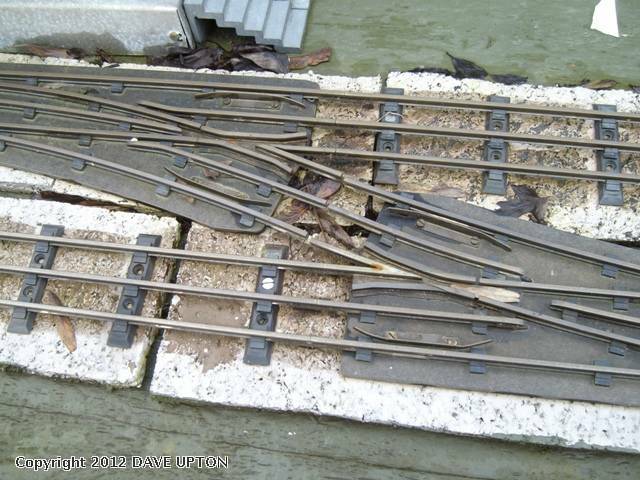 I've recently been asked about the wiring of my layout so thought some information on here might be of interest. In my world the key thing is simplicity; make it too complex and all the fun soon gets knocked out of the pastime. Originally I envisaged one continuous loop but before committing to buy decided a pair of parallel loops would be so much better. Whilst waiting for the track to arrive I struck lucky with some Maldon Rail points on eBay and felt sure they would be a great asset enabling switching from one loop to the other. Almost as soon as I got them I realised this would have considerable implications in the electrical dept and I began to doubt the wisdom of the decision. I also came to see that used in this setting I would have been much better off using the Maldon Rail Express Points, however the cost of four new ones was just too much for me at that time. 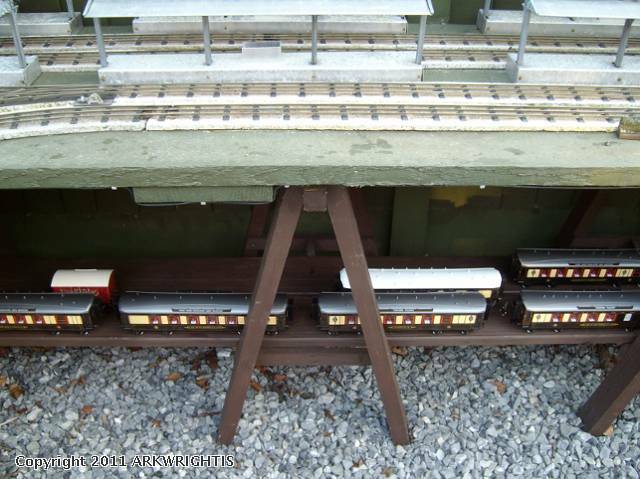 Keen to keep things very straight forward I have built the points into the layout as aesthetically they look wonderful however the pairs of points are not actually connected together thus keeping the wiring all very simple - the way I like it. 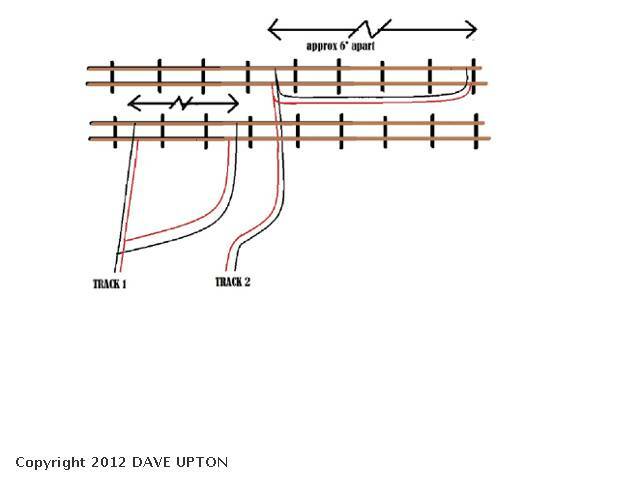 Here is a very simple schematic of how my track is wired into a very basic twin track controller. ItÃ?Â¢? ?s very simple, but as my YouTube clips will show, it works and thatÃ?Â¢? ?s really all I require. As you will see and read I've taken the opportunity to reconfigure the Canopy Stations so that they now stand side by side which makes a change. Here are some more photos taken during the day. Finally identified and bought a quantity of a styrene material I've been interested in for a while, something called Depron (here in the UK at least). 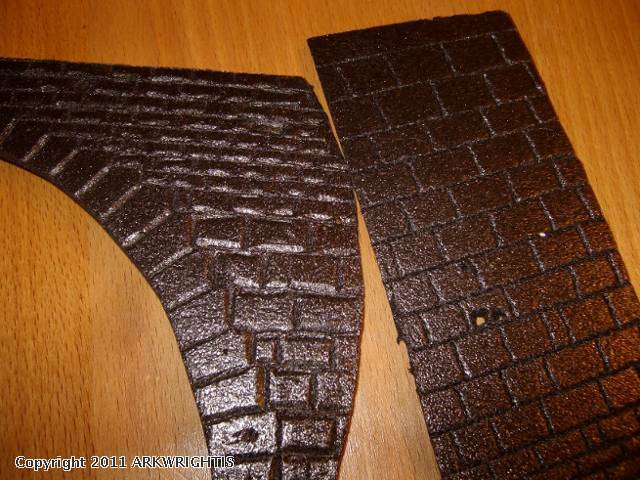 It's fantastic to work with and can be quite delicately scribed with detail such as brick & stone. I find a propelling pencil works well as a scriber. 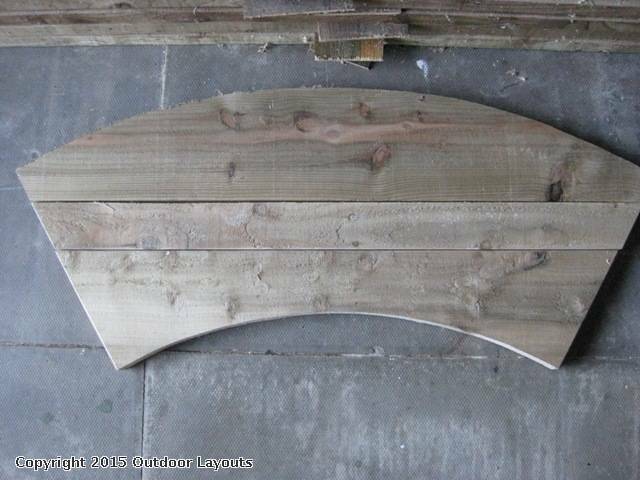 I believe you can also wood grain effect it with a saw blade. 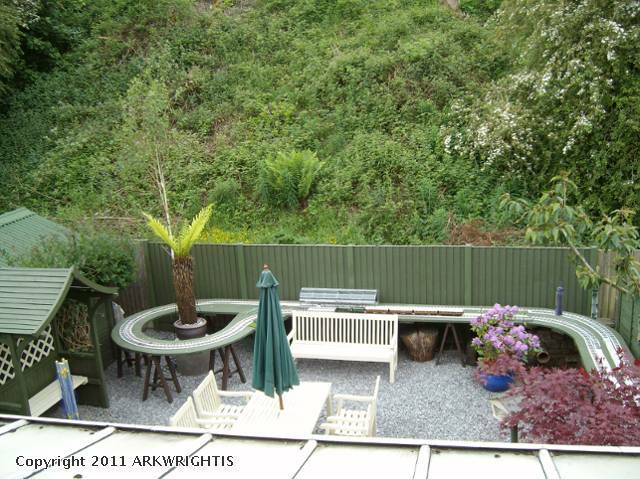 From my point of view its perfect for the garden as the weather can't harm it. You can paint it with water based paints from the timber shades range. What you see here is my tentative effort at a tunnel mouth. The scribed Depron is glued onto ordinary polystyrene with latex based Copydex which again is fine outside. It's had a coat of 'Stone' coloured paint, but I will be detailing it with a much darker mix when the building work is finished - still some way to go, but I thought it a good idea to show how it started out. This is how the tunnel mouth looks now I've finished it. I took inspiration from the Totley Tunnel which until the completion of the new high speed tunnel, held the record as the longest in the UK at 3.5 miles. It was completed in 1893. Because my effort is not worthy to take the name I just added the date stone! The photograph is of the locomotive and coaches featured in the film, the 0-6-0 LMS 'Jinty' tank engine and the 6 wheeled coaches in Midland Railway livery both by Darstaed Vintage Trains. I've been a bit slow perusing the Archive, and just spent some time here. 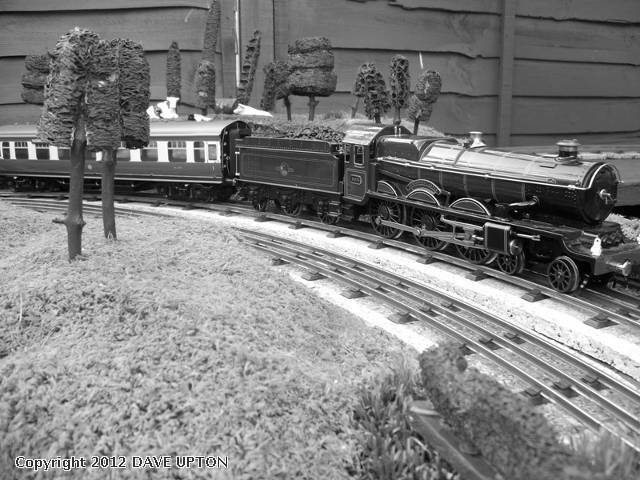 When I was very young (not recently...) 0 gauge was common for garden railways in the UK, long before G scale happened, and it worked really well - just like this one - because you could stand back and get the sense of trains running in the open, which is what this is all about. At that time clockwork power was still respectable, though often called 'spring drive' to make it sound more technical, and people got remarkably long runs out of it. We've come a long way! 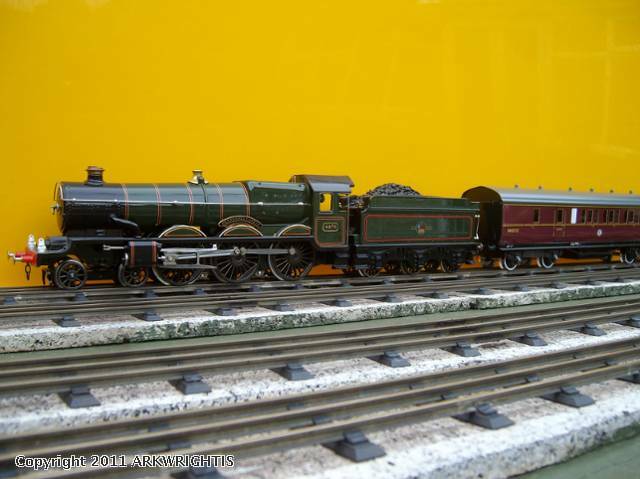 I like your GWR 'Castle' class - that's a lovely model of a very fine engine. Thank you Andrew and I do agree, being able to enjoy these models outside in the open air is one of the best things that can happen to them. Unfortunately weather has a lot to say about this and here in the UK a great deal to say! 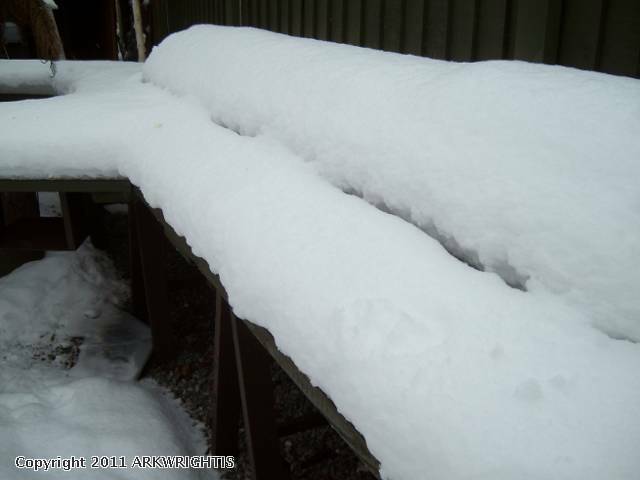 Currently the layout is under a good 8" if snow and has been for about two weeks and this is the second time this winter this has happened to it. Roll on Spring! 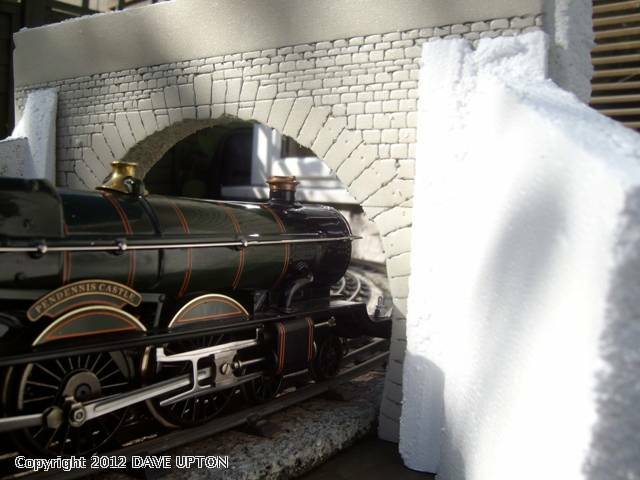 Bleak, very cold and thoroughly unsuited to garden railways - the British Winter - Feb 2nd. 2015. 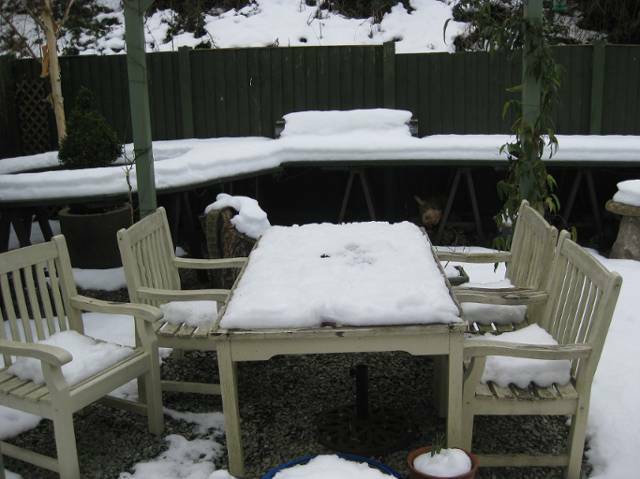 The above photo, taken in February, well demonstrates the conditions any outdoor layout has to contend with in winter. 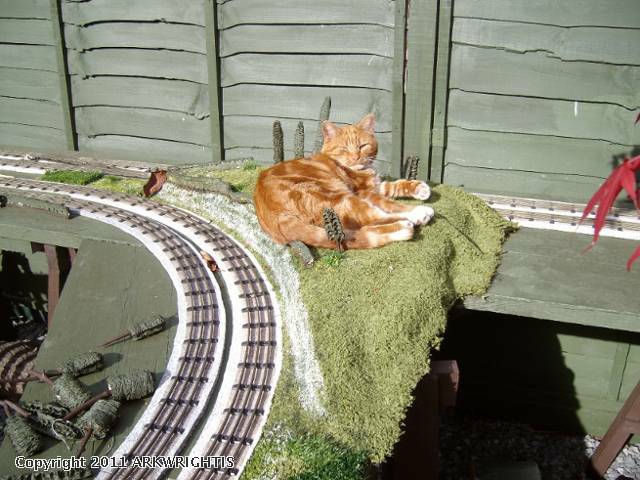 By April of this year it was clear to me that my layout, which was now about 6yrs old was beginning to suffer to the point of needing a rebuild. 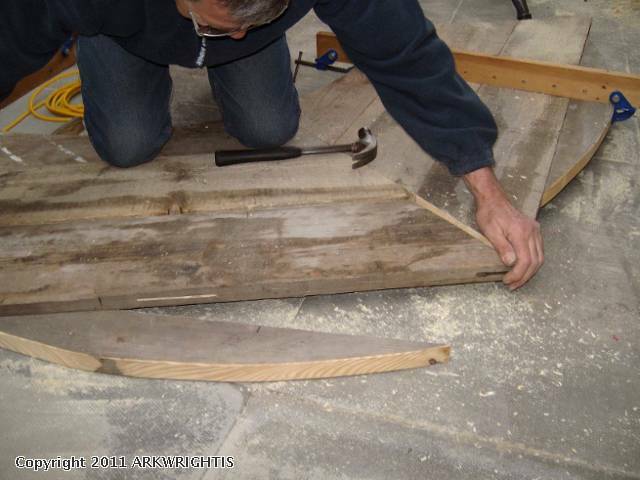 In various places the boards used to construct it were rotting rapidly. In hindsight I have come to learn that painting the wood with outdoor wood shade paint as used on fence panels has done it no good at all because all the paint really does is form a skin under which wet and damp become trapped. As a result of all this, a full rebuild has been embarked upon, hoping to learn from the experience of the past few years. 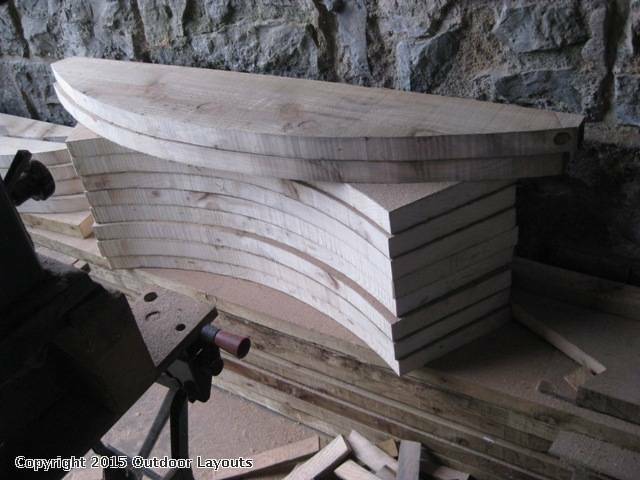 Whereas the layout was originally made of untreated scaffold boards, I have now decided to use Tantalized timber throughout which is not actually as expensive as might be imagined. Dependent on who is making the claim, tantalized timber can be relied upon to have a life-expectancy of up to 25yrs - without any further treatment necessary. If it gives me 10yrs I will be well pleased. 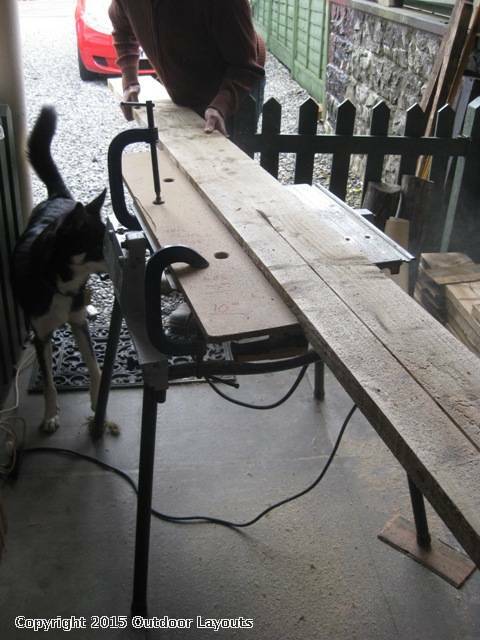 Many would simply cover timber boards with roofing felt to protect the wood but I am very wary of using a materiel so capable of scratching tin printed items should they happen to come into contact with it. 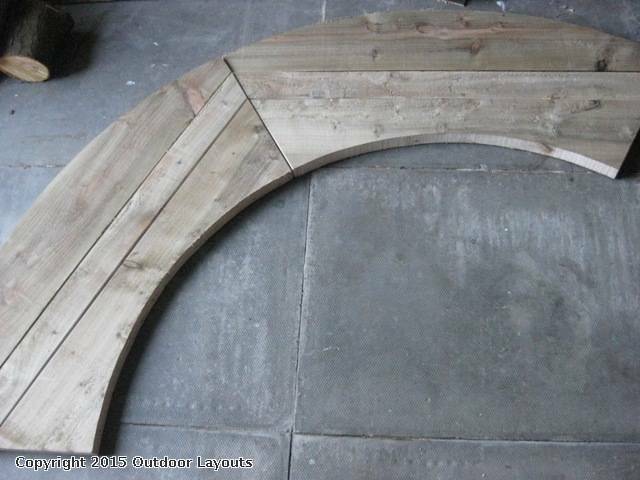 Because the layout has return loops at each end - both virtually circular in form, the timber used to make the structure require joining. 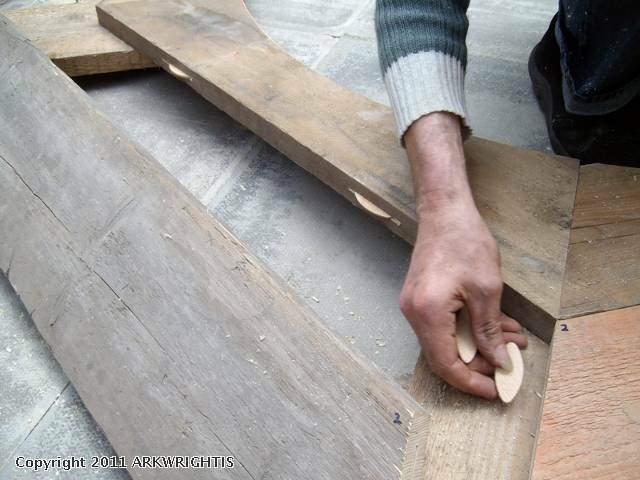 Previously ordinary treated wood screws were used. This time round, all screws will be stainless steel. Each section then has to be firmly joined on to another. Again, previously, screws were used, this time stainless steel coach bolts are to be used. 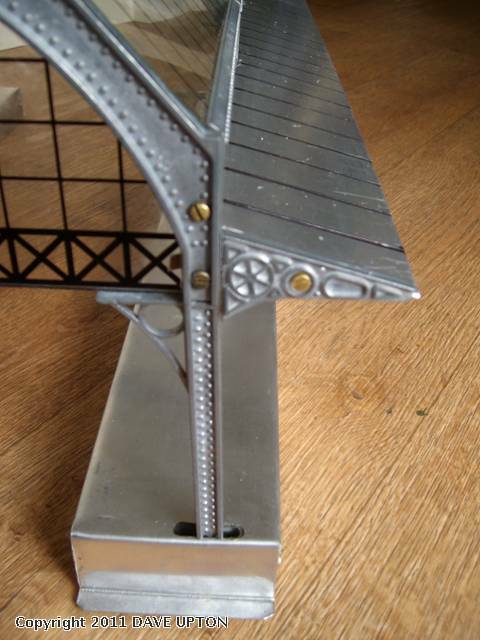 The individually parts to each section will be held apart from one another by approx 1/8" to create an air gap which will allow water to run off easily and air to circulate and dry. Work on the project started a few days ago. Initial planning. 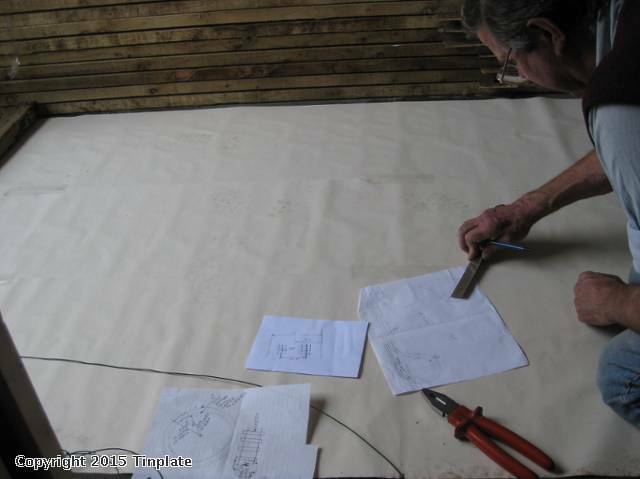 Using the reverse of some old wallpaper, the parts required are drawn to scale from a previously prepared plan below. The up-scaled template on the existing layout checking that it is correct. What each section of the return loop(s) look like when cut out.